Women in the U.S. are substantially more likely than men to say gender discrimination is a major problem in the technology industry, according to a Pew Research Center survey conducted in July and August. The survey comes amid public debate about underrepresentation and treatment of women – as well as racial and ethnic minorities – in the industry. Critics of Silicon Valley have cited high-profile cases as evidence that the industry has fostered a hostile workplace culture. For their part, tech companies point to their commitment to increasing workforce diversity, even as some employees claim the industry is increasingly hostile to white males. 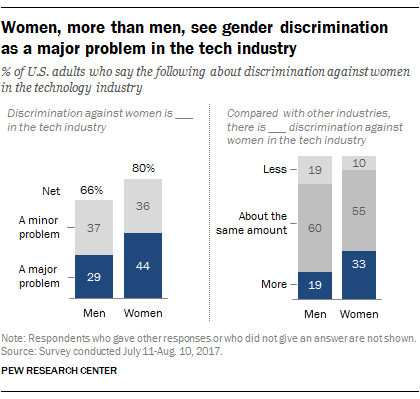 The new survey finds that roughly three-quarters of Americans (73%) say discrimination against women is a problem in the tech industry, with 37% citing it as a major problem and an equal share citing it as a minor one. But 44% of women say it is a major problem, compared with just 29% of men. And roughly a third of men (32%) say discrimination against women is not a problem, compared with 17% of women. Younger women are more likely than older women to view gender discrimination as a major problem in the tech industry. About half (49%) of women younger than 50 say this, compared with 39% of women 50 and older. The survey results are in keeping with earlier research about perceptions of gender discrimination in society as a whole. Previous Pew Research Center surveys have shown that women are significantly more likely than men to say there is gender discrimination in our society today. In a 2014 survey, 65% of women said there is at least some discrimination against women, a view shared by 48% of men. For the most part, Americans do not see gender discrimination as more widespread in the tech industry than in others. More than half (57%) say there is about the same amount of discrimination against women in tech as there is against women in other industries. About a quarter of adults (27%) say there is more discrimination against women in the tech industry, and 14% say there is less. But there are gender differences on this question, too. A third of women, compared with 19% of men, say there is more gender discrimination against women in tech than in other industries. Younger adults (ages 18 to 49) (31%) are more inclined than those 50 and older (22%) to see gender discrimination as particularly prevalent in the tech industry. 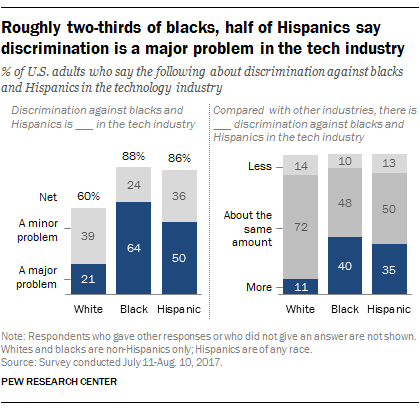 A majority of blacks (64%) say discrimination against blacks and Hispanics is a major problem in the tech industry, and half of Hispanics agree. Only 21% of whites say this is a major problem. At the same time, 37% of whites say such discrimination isn’t a problem, compared with 11% of blacks and 12% of Hispanics. Blacks and Hispanics are also much more likely than whites to say there is more discrimination against blacks and Hispanics in the tech industry than in other industries. Four-in-ten blacks and 35% of Hispanics say this, compared with 11% of whites. About the survey: These are some of the findings from a survey conducted among a nationally representative sample of 4,914 adults, ages 18 and older, from July 11-Aug. 10, 2017. The survey, which was conducted online in English and in Spanish through GfK’s Knowledge Panel, included an oversample of employed adults working in science, technology, engineering and math-related fields. The margin of sampling error based on the full sample is plus or minus 2.7 percentage points. See the topline for exact question wording.